Please sign up on SignUpGenius if you have not signed up for this exciting event! Remember, sales earned at the stores, along with your individual sales to friends, neighbors, relatives, and parents' co-workers, all count toward your Trails End Prizes ! Lastly, be sure to read these instructions. With the Take Order form, you can start selling today. Please view the training video below to see how easy it is to go out there and get people to support cub scouting! Also, click here to learn how to sell online! Scouts: How would you like to win an X-Box One Console!? The Mt. 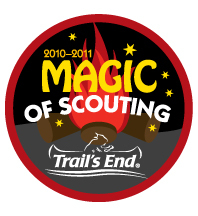 Diablo Silverado Council is working with Trail's End to offer additional prizes to all Scouts selling popcorn online starting Wednesday, November 13 through Friday, December 20. Your Scout will receive a drawing entry to win a X-Box One Console for every online sale he makes starting November 13. The more sales your Scout makes, the more entries he will receive! Along with the drawing entries your Scout can earn a $5 Wal-Mart Gift Card for every 3 items sold during this promotion. Is your Scout just short of the $2,500 prize level to qualify for the Trail's End Scholarship Program? If so, this is his opportunity to get to the qualifying level while earning more prizes! Scouts: Click here to learn how to sell online. Leaders: Click here to learn how to track your unit's online sales. This program does not qualify for the Mt. Diablo Silverado Prize Program or Bonus Clubs. Please contact your den leader if you have not signed up for this exciting event! 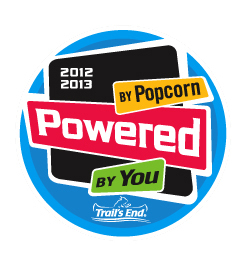 Remember, sales earned at the stores count toward your Trails End Prizes! These prizes are listed on the Face-to-Face Take Order forms that were handed out at the last Pack Meeting. These sales and the individual sales you make selling to friends, neighbors, relatives and parents co-workers will count towards your Trails End Prize. Take Order Popcorn sales - $10 Target Gift Card for every $100 popcorn sold on Face-to-Face forms - sell $500 worth of popcorn, get a $50 gift card! Also, the Den that sells most on an average per cub basis gets an ice cream party prize! With the Take Order form, you can start selling today. Please take some time to view the training video, so that you can see how easy it is to go out there and get people to support cub scouting! Way to go! Over all MERIDIAN DISTRICT did $150,000+ in total sales which is an increase of 28%! AMAZING JOB EVERYONE!! The popcorn season has arrived! Our sales goal for this year is $5000. Not only every scout participating in this annual fundraising event receives a patch, more prizes and rewards are available for top selling den and scouts. There are many ways to participate. Besides the upcoming show-and-sell at Safeway and Lucky, scouts can sell door-to-door and online. Learn more about this at our first Pack Meeting on Wednesday, September 9th. Meanwhile, get a head start and check out the training videos for tips on selling popcorn. Contact our Popcorn Kernal Yuji Yamada if you have questions. If you are the first den for the day, den leaders, please arrive about 10-15 minutes early to help set up. A Den leader, Assistant Den leader or designated leader must be present at the time of the shift. Parents should not just drop off cubs and leave. They should supervise their child. You will need to keep track of what was sold and which cub worked the shift. There will be a binder with a tally sheet that will help you keep track of this information. Each den will have their own section in the binder. Customers can make cash donations, if they don't want to buy popcorn. There will be an envelope for this in the cash box. Customers can make donations to the military. There will be an envelope for this in the cash box as well. Last den of the day should help clean up. We shouldn't leave a mess. Contact Popcorn Kernal Yuji if you have questions. October is popcorn month. While our popcorn kernel is working hard with leaders to sort out the details, I would like to share with you another view of corns. That is corn mazes. 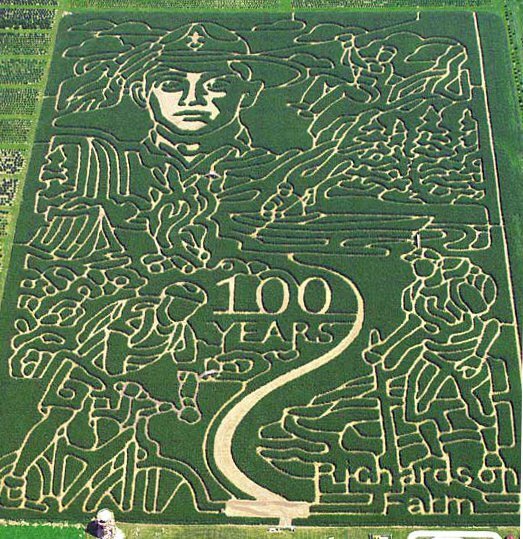 Amazing corn mazes around the country celebrating the Centennial of BSA. Click on the picture to see more.